The biggest cross-promotion event in MMA history is quickly approaching. 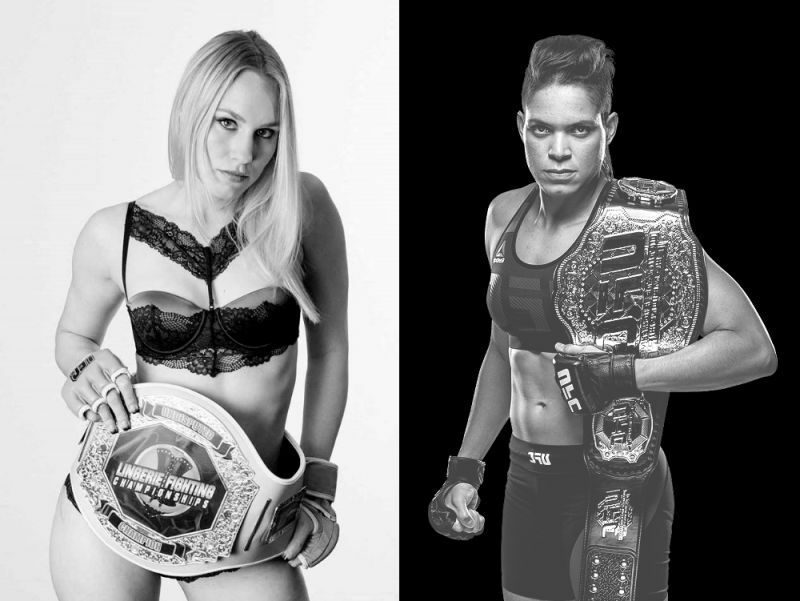 With the LFC’s European Champion Jolene 'The Valkyrie' Hexx [19-5-1] taking on the UFC bantamweight champion Amanda ‘The Lioness’ Nunes [16-4]. The media has dubbed it as a publicity stunt, but for the real fans, we got what exactly what we asked for. With just weeks to go before the fight, I tried to reach out to Jolene’s camp to see how training was going. Everyone was tight-lipped, but referred me to the LFC staff, who reluctantly gave me the scoop that was as surprising as anything I have ever heard in MMA circles. It turns out that Jolene was asking for another trainer, thinking that coach Joel Kane lacked the insight to go up against the UFC. After the LFC Prez, Maxine ‘The Boss’ Frost castigated him and told him the only pink (team) in his future would be a pink-slip, Joel focused and proved that he is definitely capable of training an elite fighter. The press conference was a standard affair, with both fighters giving the expected answers. Both champions appeared comfortable and confident that they know how to dole out punishment in the ring. Joel Kane had at some point adopted a new persona, defending his fighter and making valid points about how Jolene stood more than just a chance beyond Amanda not showing up for the fight. “Krav Maga is as lethal a discipline as there is, and Jolene is well versed in all the brutal aspects of it,” Joel said. The weigh-in did uncover some hostility that one fighter was experiencing, possibly feeling disrespected and given very little hope of winning, Jolene glared ominously at Amanda and put her right fist as close to Amanda’s nose without touching it. Amanda responded with a smile and tried to make Jolene flinch with her own quick right hand. Jolene was stoic and didn’t even blink. The all female undercard alternated between LFC and UFC fights.It wad an action packed night of fights and easy to say that fans/viewers got what they paid for. The action was fast paced and dripped with the obvious sacrifice a fighter makes to flourish in the ring and put on a show. The moment had arrived: the temporary merger of two MMA leagues was at hand. Each champion wore a scowl on their face, as if making a fashion statement while the introductions and instructions played out. Jolene chose a more conservative outfit than she usually wore, but it featured enough pink trim to remind people of the league and team that she was representing. Amanda wore a black and blue ensemble. The combatants wasted no time in seeking out the center of the cage, bypassing the traditional touching of gloves. Jolene faked a kick with her left leg that surprised Amanda. Seeing a small opening, Jolene threw a sharp right and followed it up with a stiff punch that nearly lands and drew gasps from the crowd. Amanda found herself driven back by both shock and the feel of Jolene’s power. Jolene landed two quick kicks to the side of the UFC champion and drove her up against the cage with a harsh elbow to the jaw. A barrage of knees and elbows followed, as Jolene pounced while in the clinch. More knees to the midsection preceded by crisp punches to the face. It was obvious that ‘The Valkyrie’ was out to prove a point. Amanda finally pushed off a much taller opponent with both arms; a guttural scream rose from deep inside of Nunes. The pace now slowed to a more cautious level. Jolene had made the most of her opening gambit and was now going to wait for another opportunity to instigate. Amanda stalked Jolene confidently, displaying the moxie of a champion who believes she is the better fighter and has all the time she needs to overcome. In spite of well-timed moves to close the distance between them, Amanda was unable to corral Jolene who showed excellent footwork and instinctive head movement. At this point in the fight, it was easy to see that strategy was playing a bigger role, especially for Nunes. Near the end of the round, Jolene had a lapse in concentration and opened herself up to the hard charging Amanda who ripped up Jolene and quickly, yet quietly, maneuvered her to the ground in full guard and applied a crushing rear naked choke. Jolene looked trapped, her eyes conveyed a sense of inevitably, as she struggled to extend the round. With time running out, the bell rang, and to the surprise of most, the LFC was still standing. Joel Kane was genuinely effusive and proud of his fighter, as he gave her a high-five and shouted loud words of praise that traveled to the upper seats. Both fighters looked fresh and confident as they stared across the cage, with Jolene sporting a cynic grin on her face. Amanda made a straight line for Jolene, who stepped to the side and flicked a quick punch to the face/nose of her opponent. A line of blood flowed quickly down Amanda’s lips and chin. This angered Nunes and caused her to throw a flurry of long punches, which Jolene absorbed by timing them with purposeful head movement. Aside from the opening punch, the beginning of the second round was mostly a defensive drill for Jolene to avoid a determined Nunes. Amanda’s kicks were a bit wild, but one spin-kick grazed the chin of Hexx. Amanda smiled and said something to Jolene who returned the verbal volley. Mid-way through the first round, Amanda was able to execute a text-book take-down that Jolene scrambled to get out of right away. Kane implored his fighter to stay focused and breath. The accuracy and power of Amanda’s arms started to take their toll on Jolene’s face, which now showed some bruising; a small cut had formed under he right eye and her blood was now a part of the visual. The pace sped up with rapid exchanges taking place at opposite ends of the octagon. Suddenly, as if in agreement, the battle proceeded to the mat. Caution was bravely hurled away as both women attempted to dominate positions. The coaches looked on nervously, anticipating a favorable outcome. With time running out, Jolene won an awkward choke and tried to apply as much pressure as needed to earn a submission. Amanda was able to escape and rose to her feet as the round ended. There was a sense that the fight was moving too quickly, and that sporting appetites, hungry for violence, needed the proof of a conclusive victory. The last round started in the center of the ring, with both fighters sending out kicks, trying to set up finishing moves with the worst of intents. The kicks were more of a nuisance warfare trying to affect the field of vision, but Jolene did land one hard kick to Amanda’s ribs. Nunes rushed in and bullied Jolene into a corner and began an assault to try and end the bout. A hammer fist to the side of Jolene’s face looked painful, and that was just the beginning. Knees came in at different angles, and each one looked more powerful than the last. Hexx was absorbing it all, looking alert and capable of weathering the onslaught. With no real opening to take, Jolene squeezed her energy into concentric punches to Amanda’s midsection; this slowed ‘The Lioness’ down and allowed ‘The Valkyrie’ to escape. Both women now sensed it was time to take a moment to gather their thoughts and to invigorate themselves with much-needed air. The round was half over and all the training, all the pre-fight hype, and the test of sheer will power was being displayed. Hexx moved in first for her closing attack. She came with fists and quick elbows to the side of the face. Nunes absorbed and countered with more kicks to Jolene’s core. One last thunderous right buckled Jolene’s knees. Both of their faces were palettes of blood and sweat with colorful bruising to balance things out. Their arms finally dropped as the bell rang. The tired warriors looked at each with congratulatory grins, and with a nod, Jolene indicated that she would do it again. The crowds were on their feet as Jolene and Amanda hugging it out in the middle of the cage. Both coaches ran into the cage and lifted their fighters onto their shoulder and paraded around as to declare victory. What a fight. Nunes earned a unanimous decision win, but Jolene won over fans and taught her critics a valuable lesson. Joe Rogan rushed into the cage and approached Amanda first, she praised Jolene and spoke of how their styles meshed well to produce a fast tempo that left spectators wanting more. Jolene was equally gracious, and said that Amanda was worthy of her status as one of the best MMA fighters around, regardless of gender. After one last and very emotional hug, the cage emptied, except for Joel Kane, who still lingered… with excitement and optimism in his eyes.